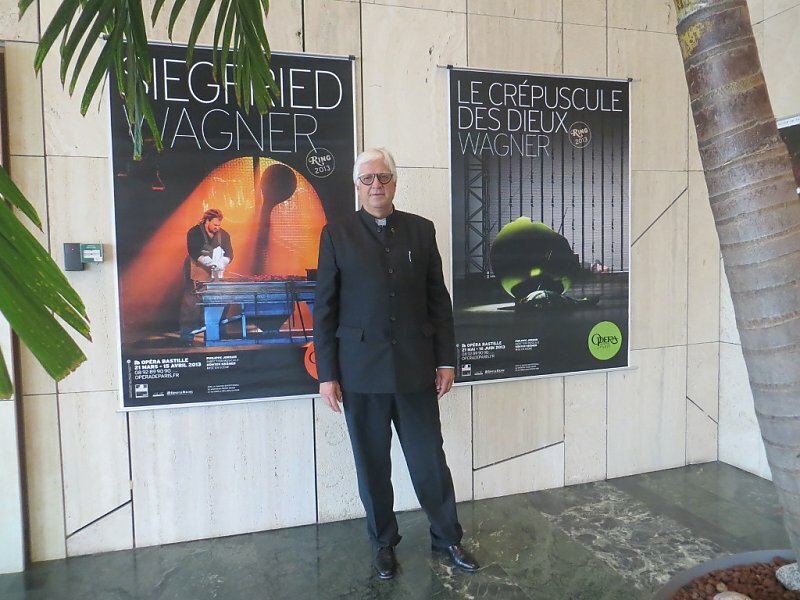 Nach der Ausstellung von Wagner Postern der meisten seiner Werke während des Richard Wagner Festivals im Palace of the Arts Budapest im Juni 2013 lud mich das MÜPA Management ein, in diesem Jahr ein weiteres Mal eine Sammlung von Wagner Postern zu zeigen, diesmal ausschließlich zum “Ring des Nibelungen” mit etwa 65 Stück. 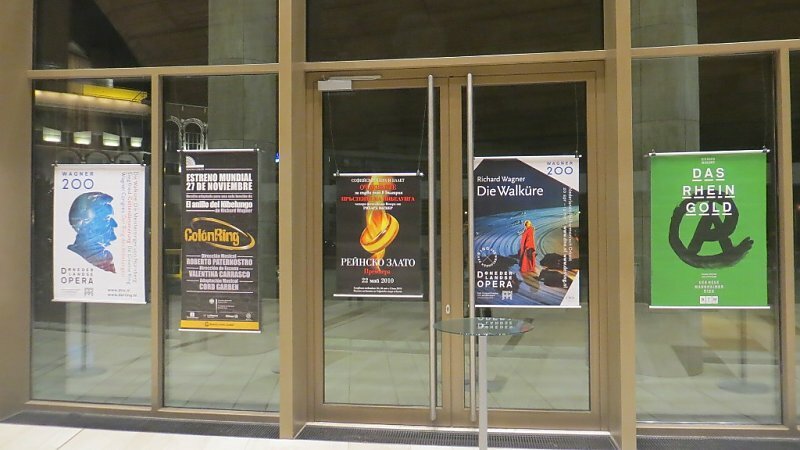 Der „Ring“ stand im Juni zusammen mit „Tannhäuser“ auf dem Spielplan des Festivals. Richard Wagner was a composer – he created music, a music which broadly set the premises for the musical development of the 20th century. Music is not visible, though Wagner lets Tristan say in his delirium at the end of “Tristan and Isolde”: “Wie, hör' ich das Licht?” – (“What? Is it the light I hear?”). That means, in a real masterpiece of universal dimensions such as the Oeuvre of Richard Wagner the boundaries between acoustic and visual perception are dissolved – you hear his music and you see before you what this music is telling you. 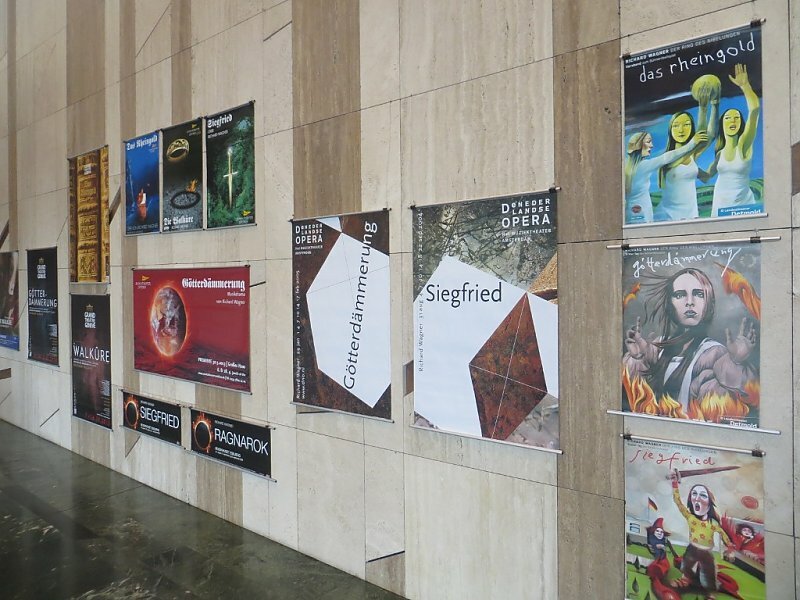 And you see this “Ring” poster collection assembled over the last 16 years from all over the world of opera and you will hear the music behind them, particularly when you know Wagner’s music. This is probably the case since you came to see the “Ring” during the Wagner Days of the Palace of the Arts in Budapest in June 2014. Wagner’s opus magnum, “The Ring of the Nibelung” is the largest ever opera oeuvre created by man and occupied Richard Wagner for some 25 years. In the four music dramas “Das Rheingold”, “Die Walküre”, “Siegfried” and “Götterdämmerung” he projected his vision of a better world, demonstrating the incompatibility of power and love. With the “Ring”, Wagner proposed socially revolutionary ideas and concepts of great relevance for the life of us human beings and societies at large, with a real claim to universality. 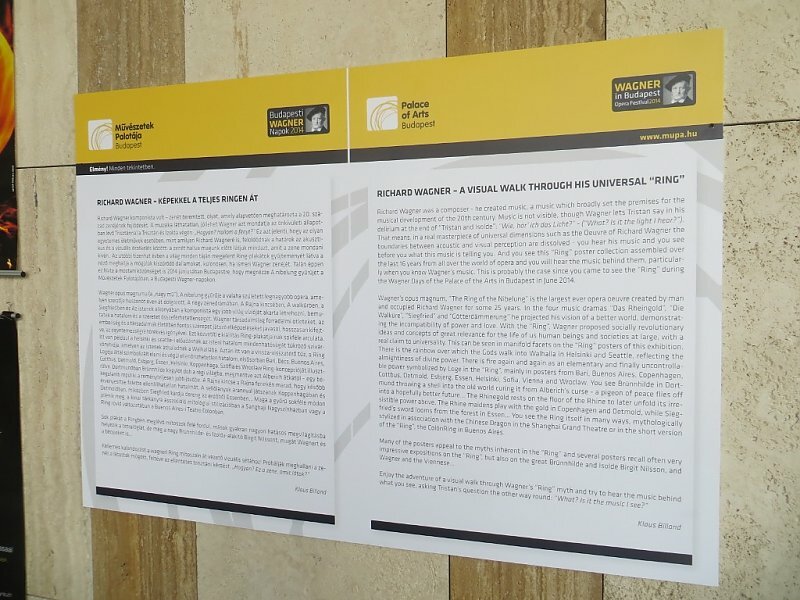 This can be seen in manifold facets on the “Ring” posters of this exhibition. There is the rainbow over which the Gods walk into Walhalla in Helsinki and Seattle, reflecting the almightiness of divine power. 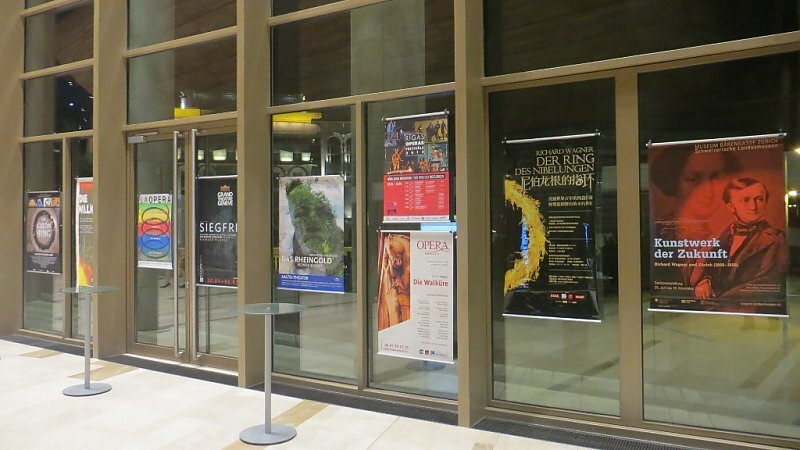 There is fire again and again as an elementary and finally uncontrollable power symbolized by Loge in the “Ring”, mainly in posters from Bari, Buenos Aires, Copenhagen, Cottbus, Detmold, Esbjerg, Essen, Helsinki, Sofia, Vienna and Wroclaw. You see Brünnhilde in Dortmund throwing a shell into the old world curing it from Alberich’s curse – a pigeon of peace flies off into a hopefully better future… The Rhinegold rests on the floor of the Rhine to later unfold its irresistible power above. The Rhine maidens play with the gold in Copenhagen and Detmold, while Siegfried’s sword looms from the forest in Essen… You see the idea of a “Germania” as the capital of Germany in the 1940s of the Paris Bastille Opera. You see the Ring itself in many ways, mythologically stylized in association with the Chinese Dragon in the Shanghai Grand Theatre or in the short version of the “Ring”, the ColónRing in Buenos Aires, as well as in Sofia. Many of the posters appeal to the myths inherent in the “Ring” and several posters recall often very impressive expositions on the “Ring”.